Can This Liquor-Making Plant Correct California’s Parched, Fire-Prone Landscape? 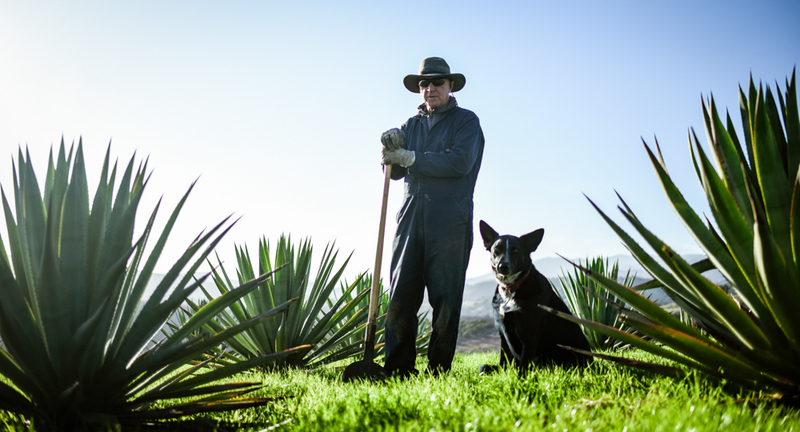 Neither much of a farmer nor drinker, La Paloma Ranch manager John Kleinwachter, (pictured with Vinnie the dog) finds himself as one of California’s first jimadors, the Mexican name for agave harvesters. 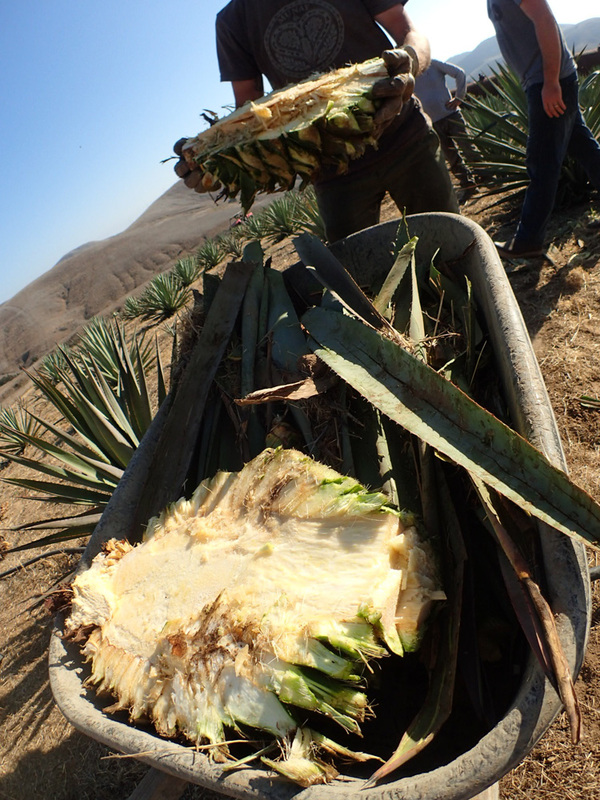 By everyone’s admission, the first harvests of blue agave on the Gaviota Coast have been a bit clumsy. Unlike plucking fruits, picking vegetables, or mowing grains ​— ​activities that are familiar enough to the everyday Californian farmer ​— ​these sharp-spined, sturdy cacti are much more bizarre beasts. Their fibrous leaves must first be severed with a spade-like tool called a coa, and then the shallow, spindly roots are hacked away to release the piña. That oversized, pineapple-looking orb ​— ​which can grow as big as 150 pounds, although these early ones are only a third that size ​— ​is then chopped into chunks that will later be cooked, mashed, juiced, fermented, and distilled into liquor. So when it comes to turning agave into alcohol, Mexico enjoys a firm head start over California. The indigenous Mesoamericans came first, making a fermented, beer-like beverage called pulque from agave for at least 1,000 years. There’s a sliver of research that suggests distillation may have occurred prior to Spanish contact, but the dominant belief is that it was the conquistadors of the 1600s who first started making liquor out of the plant when they grew thirsty for brandy. The tradition was professionalized over the next two centuries, primarily by the Cuervo and Sauza families. In 1974, the Mexican government protected and regulated the “tequila” name, much like France owns “Champagne,” and did the same for “mezcal” in 1994. What no one is laughing about here in California, though, is the potential that agave presents for the Golden State’s drought-parched, fire-prone landscape. The plants use far less water than avocados or citrus, thrive in marginal soils where little else will grow, and are so naturally waterlogged that they can stop a wildfire in its tracks. Doug Richardson witnessed that firsthand behind his Toro Canyon home during the Thomas Fire of 2017, which couldn’t penetrate the line of cacti that he planted. Widely known as “The Banana Man” for the 15 years he farmed that tropical fruit at La Conchita in the 1980s and ’90s, Richardson is no stranger to exotic species. Raised in Manhattan Beach, he came to the University of California, Santa Barbara, to study geography but got caught up in farming while reviving an old apple orchard atop Kinevan Ranch off of San Marcos Pass, where he lived during college. “I’m pretty much a self-taught agricultural guy, but I’ve been doing it continuously since I was about 18 ​— ​I just had my 70th birthday,” said Richardson, whose salt-and-pepper, shoulder-length hair and tanned, ever-outdoors skin looks at least 10 years younger. Among other accomplishments in his landscaping career, he served as chair of Santa Barbara City College’s Environmental Horticulture Department in the early 2000s and built the school’s ag library. “It is just a consuming passion,” he said of his decades in the dirt. As concerns came up over how much water his bananas and more popular crops like avocados required, Richardson started investigating more sustainable plants and tuned into the potential of agave about a decade ago, just as the current drought was about to begin. Today, his Drylands Farming Company sells and plants agave, prickly pear (40 different types and every color in the rainbow), and erosion-controlling vetiver grass, as well as native and edible plants, mainly as landscaping for small residential projects. But calls about the agave from more commercially minded entities are steadily increasing, with inquiries from all over California as well as Arizona and Texas. Most want to plant the coveted blue weber variety, but Richardson now knows that that species is very susceptible to frost. 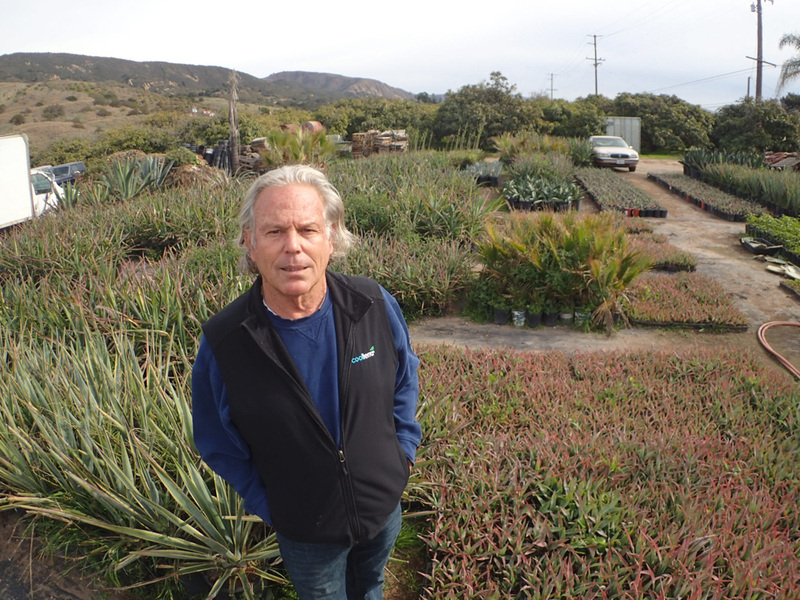 He’s quietly built his nursery and now sells quite a bit of agave, including an acre that he put on Olive Mill Road in December, among other small Montecito plantings, and many large plantings scheduled for later this year. He’s become the go-to source in the whole country right now, as potential competitors in the wholesale nursery industry are slow to adapt. The human history of La Paloma Ranch goes back to the Chumash times, when the land was used as a fishing camp by Santa Ynez Valley villagers in the summertime. It served as the westernmost grazing land for Mission Santa Barbara’s cattle, was granted to the Ortega family in 1841, and 25 years later became home to the Orellas, whose ancestor Andres de Cota first crossed the property as part of the Portola expedition in 1769. In 1901, Josefa Orella de Erro christened the northern portion of the ranch La Paloma (“the dove”), and the following year built the ranch home that still stands. As is typical of ranches across California, the owners of La Paloma Ranch, which is about 750 acres, have explored a wide range of agricultural enterprises, from the initial cattle herds (which more or less persisted until 2016’s Sherpa Fire burned all of the fencing) to walnuts, lima beans, tomatoes, barley, and garbanzos in the early parts of the 20th century. In the 1960s, Elizabeth Erro Hvolboll (who died last year at age 87) planted avocados, and about 55 acres of those trees remain today. “Farmers are some of the most innovative people around and have been for thousands of years,” explains Eric Hvolboll, Elizabeth’s son, who grew up in Santa Barbara but spent much of his childhood on the ranch. “The best ones are smart and not afraid to try new things.” He and his sister, Janet Erro, have continued the property’s evolution by planting agave, four types of coffee, and argan trees, a Moroccan species whose nut oils are primarily used for cosmetic products. They’re also about to bring back sheep for the first time in more than a century. 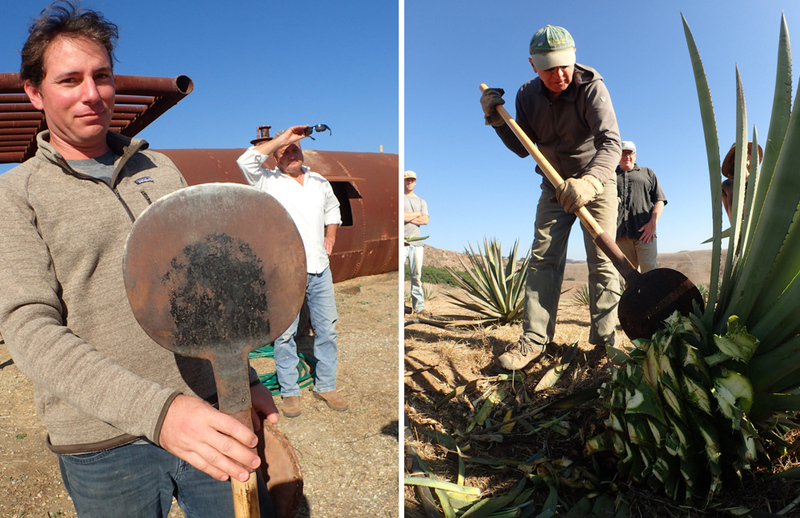 The agave idea was sparked by three college kids who came to La Paloma Ranch a few summers ago to learn the value of hard work under ranch manager John Kleinwachter. A building contractor by trade ​— ​originally from Southern California, but a Colorado and Washington State resident since college ​— ​Kleinwachter landed on the Gaviota Coast about nine years ago to pursue his wife’s dream of living on a horse ranch. About five years ago, after striking up a relationship with the Hvolbolls, he took charge of Rancho La Paloma operations. He was soon in touch with Richardson, and in 2015, they planted the first 1,000 agave plants on a rocky spot near the main house. Every year since, they’ve put in another 750 or so, and now have about 4,000 plants, with plans to continue the plantings for 10 years. That would give the guys at Ventura Spirits a steady annual supply with which to build a real market for the agave spirit. For a former contractor who never thought he’d ever live in California again ​— ​and isn’t much of a drinker at all ​— ​this agave project is proving to be a fascinating career and lifestyle twist. He cites his relationship with Hvolboll as a primary reason for sticking around, but he also feels a deep connection to the property. The second harvest ever of La Paloma agave was in early November. Anthony Caspary of Ventura Spirits (holding a coa) brought the first batch of agave spirit to taste and then ranch manager John Kleinwachter hacked at a piña while owner Eric Hvolboll (standing in background) supervised. Appreciating their ethic, Richardson introduced Caspary to the La Paloma crew, and Caspary got his hands on his first piña at the end of August. He used the sous vide process, cooking the starchy chunks in a water bath, and then forced it to ferment. The result, which he unveiled for a small crowd during the second harvest in November, was a clean liquor, like a very light blanco tequila. For the second batch of three piñas, he steamed them for 60 hours, and the result was more flavorful. He’s working on the third batch right now but hopes he has at least two good years of trials before a real harvest comes in. Though Ventura Spirits may wind up being the first to sell a steady product in a few years, they are not the first California distillers to attack agave. That was back in 2005, when J.B. Wagoner grew agaves in the hills west of Temecula and produced a product he wanted to call Temequila. The Mexican authorities quickly jumped on the name for being too close to “tequila,” and the American government wouldn’t approve the name. For that and other reasons, the brand didn’t last long. So he started planted agave near his home in Yolo County, built his own roasting pit, and began talking to the folks at St. George Spirits in Alameda, who are considered the godfathers of California craft distilling. They’d already distilled a spirit from agaves that were imported from Mexico, so Reynolds enlisted their services to work with a Lake Elsinore agave grower named Mark Carlston. He brought his agave to Reynolds’s pit, where they roasted it and then sent it to the St. George facility, which produced what everyone thought was a tasty spirit, although not enough to sell commercially. 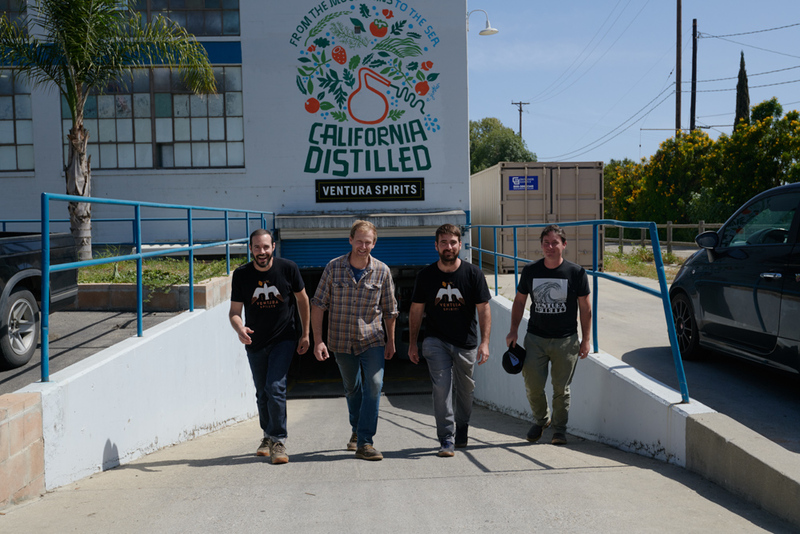 The Ventura Spirits team includes, (from left) James Greenspun, Henry Tarmy, Andrew Caspary, and Anthony Caspary, who’s leading the agave spirit project. “Making booze is not really that hard, but this is really hard, and that’s cool,” he said. He hopes that proof of concept will help get past the current chicken-and-egg situation, in which growers don’t want to plant agave because no distillers have the equipment to process and no distillers want to invest in equipment because no one is growing it. If you happened to drive down Olive Mill Road in Montecito the Saturday before Christmas, you may have spotted trucks offloading small, bluish cacti into the heart of the mudslide impact zone. This is where Berkeley “Augie” Johnson is planting a small crop of agave on the site of his former home, which was destroyed by the 1/9 Debris Flow. A recently retired executive from Corning, Johnson has endured a particularly painful string of tragic luck, as his son, Nick, drowned in a 2014 water polo training accident at Santa Barbara High. 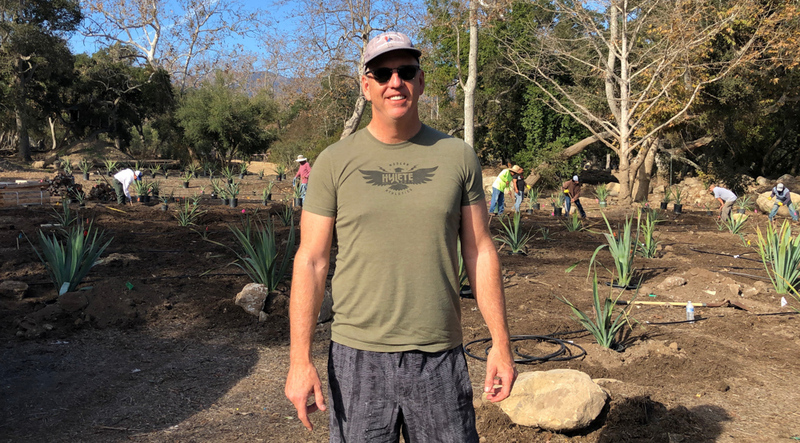 Last month, Berkeley “Augie” Johnson planted about an acre of agave on the site of his former Olive Mill Road home, which was destroyed in the 1/9 Debris Flow. 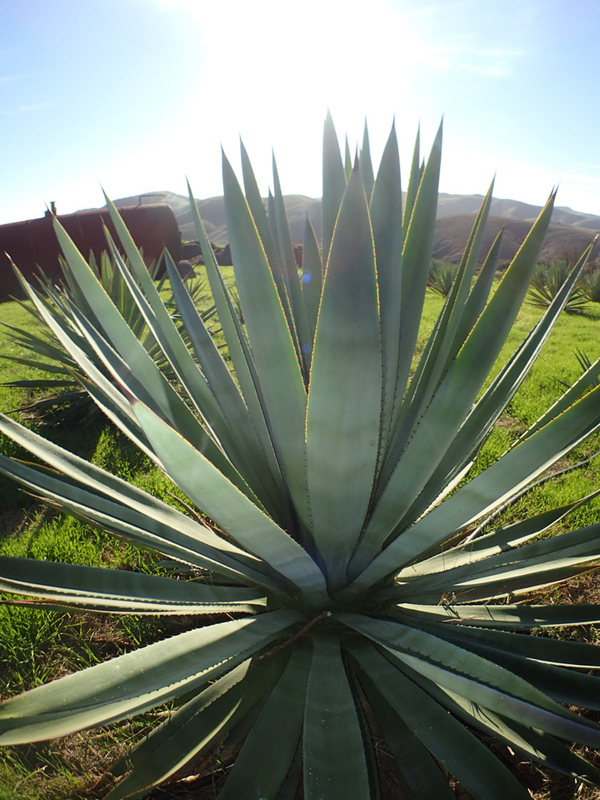 He hopes to plant much more around the area and make an agave spirit brand called Fire Break. Join journalist Matt Kettmann and “agave evangelist” Doug Richardson for a pint at Night Lizard Brewing Company (607 State St.) on Wednesday, January 16, at 5:30 p.m. to hear them talk about these agave plantings at the Santa Barbara Independent’s first-ever Pints for Press event. See drylandsfarmingcompany.com for more on Richardson’s nursery.